The two teams meet at midcourt before Tuesday’s regional semifinal. 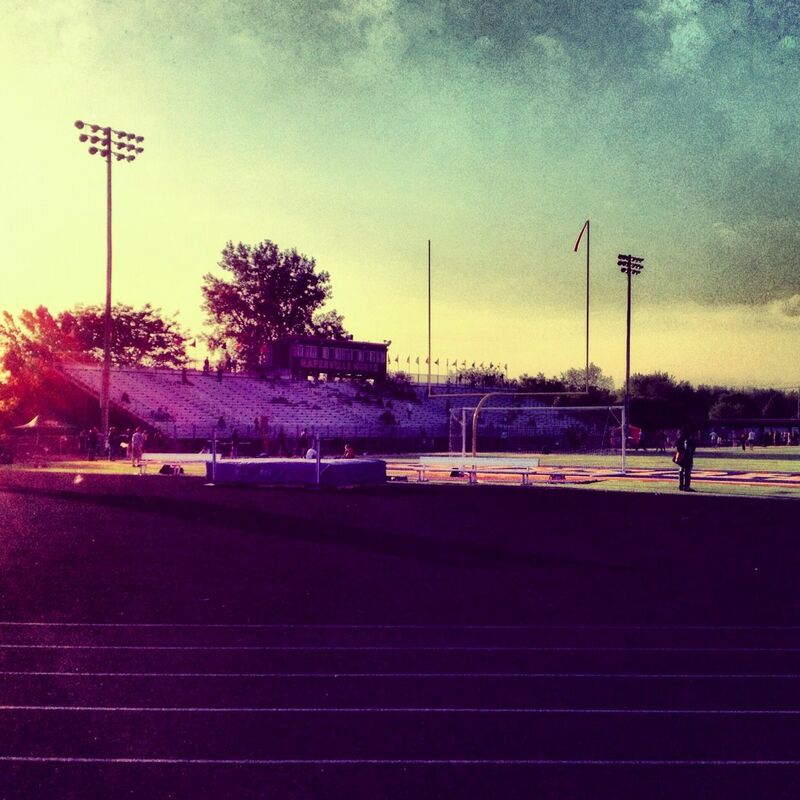 Glenbard East was just too much to handle for Oswego on Tuesday night. 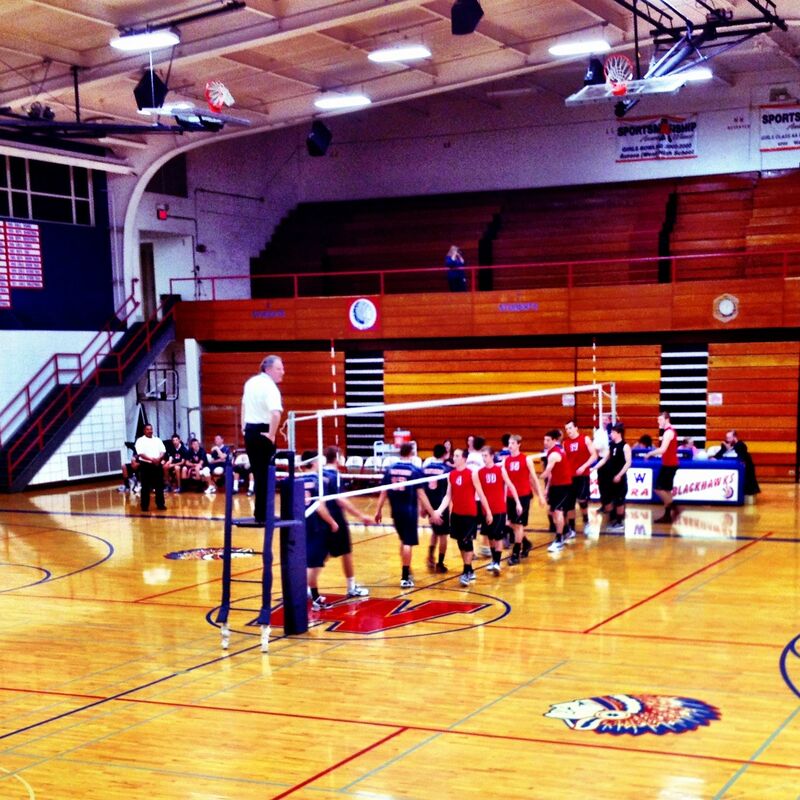 The Rams never trailed as they defeated the Panthers 25-13, 25-16 in a semifinal game of the West Aurora regional. Glenbard East (31-6), the No. 2 seed in the Wheaton Warrenville South sectional, moves on to face seventh-seeded Downers Grove South on Wednesday at 7 p.m. in the regional title game. In Game 1, the Rams used a 7-0 run to take a commanding 13-3 lead, and never looked back, winning the game 25-13. Glenbard East outside hitter Joey Farrell helped set the tone early, tallying eight kills in Game 1. “I thought they came out well. We had good energy, as we should in a regional game. Joe was on top of his game,” Glenbard East coach Marci Maier said. The second game didn’t go much better for the Panthers. Glenbard East shot out to 5-0 lead, as outside hitter Ben Haimann and middle hitter Tim Shenkin each provided two kills and two blocks. The Rams stretched their lead to 12 as they won Game 2 25-16. Middle hitter Freddy Miller led the Panthers with seven kills and three blocks in their final game of the season. Maier is hoping her Rams can get some revenge in Wednesday night’s regional final. 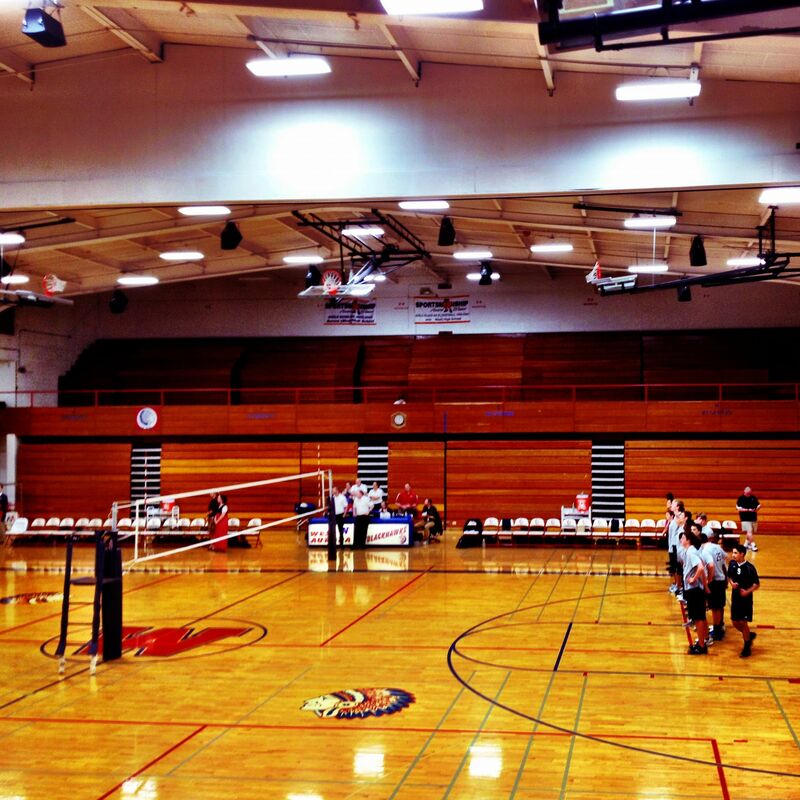 “Downers Grove South beat us in our home tournament, so we’re hoping the outcome is different this time,” Maier said. Oswego East lines up for the National Anthem on Monday. Winning a playoff game is always exciting, but it’s even sweeter when you get to knock out your biggest rival. That’s exactly what Oswego did on Monday night, defeating crosstown foe Oswego East 25-14, 25-20 in an opening round game of the West Aurora regional. It was the Panthers’ third victory against the Wolves this season. Oswego shot out to an early 11-3 in the first game and never looked back. Middle hitter Freddy Miller had five kills and a block and outside hitter Quentin Kovac had four kills and a block as the Panthers took the first game 25-14. In the second game, the Wolves capitalized on seven early errors by the Panthers to take an 9-5 lead. However, the Panthers captured the lead with a 6-0 run that featured two kills and a block from middle hitter Brandon Garcia, and never relinquished the lead. Oswego coach Amie West said that Hamman – who had four kills in the second game – was the key to the Panthers’ 25-20 victory in game two. Miller led the Panthers with eight kills, while Kovac had seven and middle hitter Kevin Oppe had five. Garcia had three kills and two blocks. Setter Blake Izzo had four kills to lead the Wolves, while middle hitter Ryan Passini added three kills and a block. The No. 15 seeded Panthers will face No. 2 seed Glenbard East on Tuesday night at 6:30 p.m. in a regional semifinal. “We have not seen them at all this year. I know that they’re ranked No. 2, so they’re a very good team. You beat good teams by having a lot of heart,” West said. Oswego’s Kristy Tracy faces Oswego East’s Alex Wagner on Thursday. More than just a win was on the line Thursday when crosstown rivals Oswego and Oswego East squared off for the second time this season. “It was just about pride. 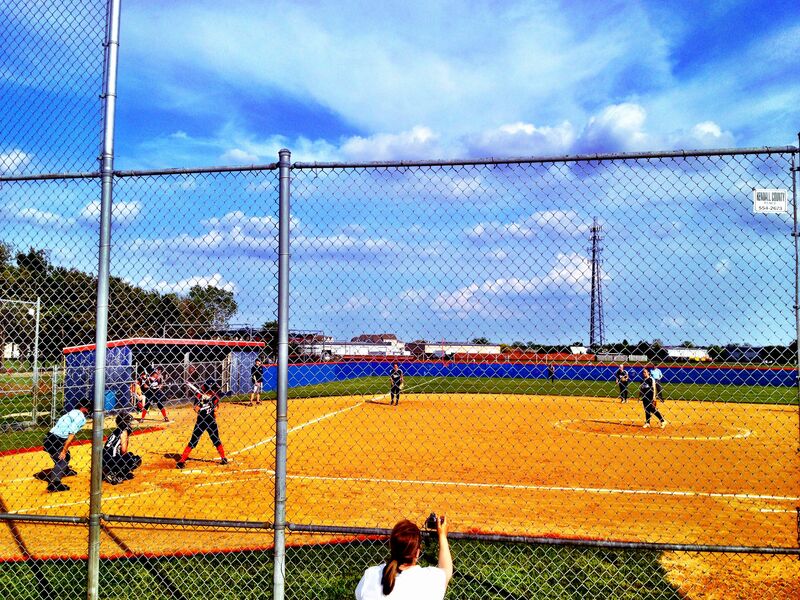 Pride over who owns Oswego softball,” said Panthers pitcher Stephanie Prentice. Prentice had three hits, including a home run, as host Oswego overcame an early five-run deficit to defeat Oswego East 7-6 in a Southwest Prairie Conference matchup. The Panthers completed a season sweep of the Wolves and earned the right to call themselves the queens of Oswego softball. The Wolves got things going early, scoring five runs in the first inning. Brittany Warnecke, Molly Talaska and Alex Wagner each contributed run-scoring hits as East pulled out to a quick 5-0 lead. But Prentice held down the Wolves from that point forward, allowing just one run and one hit in her final six innings of work. The sophomore was also a big part of the Panthers’ comeback at the plate, collecting three hits – including a third-inning home run – and scoring three runs. “I just wanted to come back and try to throw strikes again because I was a little all over in the first inning. I wanted to come back and fight for it,” said Prentice. Oswego (9-13, 2-8) chipped away at the Wolves’ lead, scoring one run in the first and two each in the third, fifth and sixth. Jessica Clark’s sixth inning single brought home Brooke Riess and gave the Panthers their first lead of the game, 7-6. Earlier in the inning, Riess hit a double to score Prentice and tie the game at 6-6. Riess went 4-for-4 with three singles and a double, scored three runs and stole two bases. Oswego East (8-14, 2-8) committed four errors and had two runners caught stealing. Wolves coach Patrick Molinari said the mistakes were just too costly. Oswego gathers in left field after their victory over Oswego East. West Aurora’s Royce Golembeck prepares to launch in the pole vault. Paced by a dominant performance in the field events, West Aurora’s boys track and field team took first place at the Oswego Outdoor Invite on Friday. The Blackhawks tallied 161 points while Aurora Central Catholic finished in second place with 129. Host Oswego followed close behind in third place with 110 points while East Aurora ended up in fifth with 45. 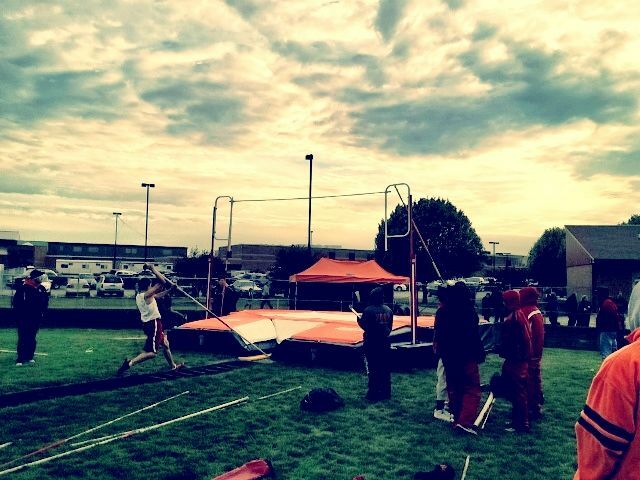 The Blackhawks won seven individuals events, including five of the six field events. Aaron Kennebrew finished on top in both the high jump (6 foot, 1 inch) and triple jump (40-09.5). The junior jumper set a personal record in the high jump. The Blackhawks swept the top three spots in both the shot put and the discus with Lijah Spears finishing on top in both events. Spears was followed by David Aleman and Shaq Redmond in the discus. Jorgeluis Ramirez and Aleman finished second and third in the shot put. With a final jump of 12-06, pole vaulter Royce Golembeck finished first in his event for the second straight meet. Golembeck also took first in the pole vault at the Peterson Prep at Kaneland last weekend. On the track for the Blackhawks, Vontrel Hawkins took first in the 400 meter dash (50.78) and while Greg Roache won the 110 meter hurdles (16.01). Roache also finished third in the triple jump. Lamb hopes the Blackhawks’ success on Friday carries over into next week’s Kane Country meet, which will be hosted by West Aurora. Despite being the smallest school at the six-team event, second-place Aurora Central had a strong showing, winning three individual events and two relays (4×400 and 4×800). Matt Meyers took home first place in both the 800 meters (2:00.40) and 1600 meters (4:31) while sprinter Joseph Fese won the 100 meter dash (10.84). Chargers athlete Patrick Lefevre finished second in the triple jump and 110 meter hurdles and third in the 300 meter hurdles. Third-place Oswego was paced by long-distance runner Caleb Beck, who finished first in the 3200 meters (9:31.10) and jumper Alain Dixon, the champion on the long jump (21-00). 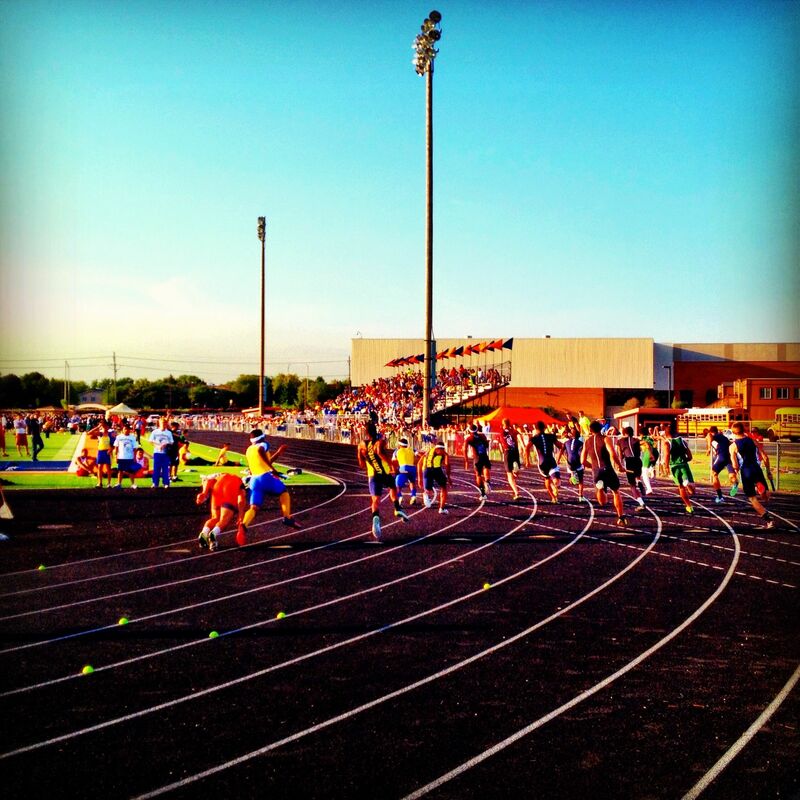 The host Panthers also won the 4×100 and 4×200 relays. 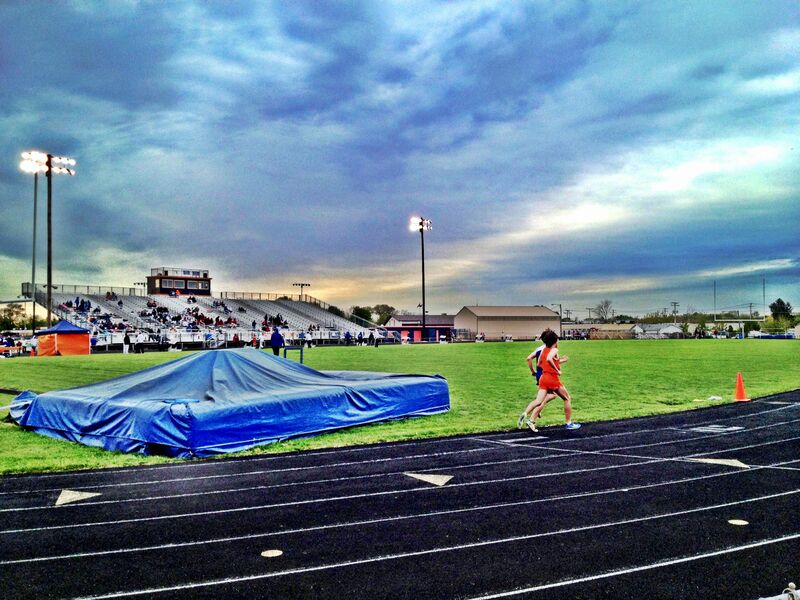 Beck blew past his competition in the 3200, finishing 45 seconds ahead of second place Ricky Barajas of East Aurora (10:16). East Aurora rounded out area teams in fifth place. Blazing sophomore Desmond Gant once again led the Tomcats, finishing first in the 200 meter dash (22.58) and third in the 100 meter dash (11.11). 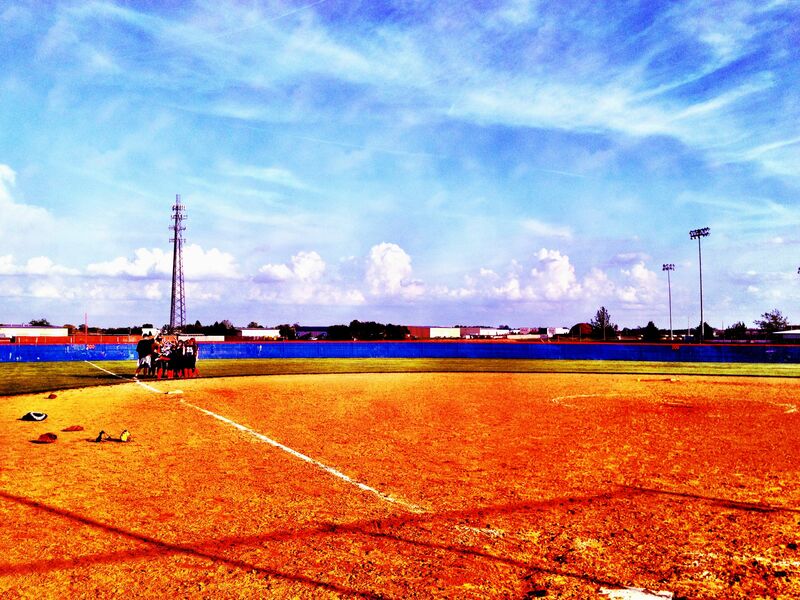 Oswego catcher Jessa Garcia picked the perfect time to hit her first home run of the season. The junior’s three-run homer in the fifth-inning broke a 4-4 tie and the Panthers held on to defeat Yorkville 7-6 to take home first place at the Fox Valley Third Annual Softball Tournament. Oswego took advantage of some early miscues by Yorkville and jumped out to 4-0 lead. The Foxes gave up three unearned runs as they committed four errors in the first four innings. Yorkville evened the score with a four-run fifth inning that included RBI base hits by Corrine Rowe, Lauren Rhodes and Madeline Avery. The Panthers quickly recaptured the lead in the bottom of the inning when Garcia’s three-run homer soared over the center field fence. Rowe narrowed the Foxes’ deficit to one when she hit a two-run homer in the sixth inning. The Foxes had runners on first and second with one out in the seventh inning, but Oswego (7-7) pitcher Jessica Clark was able to retire the next two Yorkville batters to seal the Panthers’ victory. Clark pitched a complete game for the Panthers while also registering three hits at the plate. Carlson said the Panthers played their best softball of the season in wins over West Aurora, Metea Valley and Yorkville in the Fox Valley Tournament. Yorkville (11-5) coach Kathi Dockstader said the Foxes were hindered by a lack of motivation. Yorkville and Oswego will play again in a doubleheader later this month and Dockstader is already looking forward to the rematch. Naperville Central midfielder Carly Franzese didn’t know what to do after she scored a goal early in the Redhawks’ 2-0 victory over Oswego Monday afternoon. It was the first time the senior had scored a goal in a high school game. It was forward Abby Joyce who made the pass to Franzese, setting up a goal that gave the Redhawks an 1-0 lead just five and half minutes into the game. Forward Kristen Krebs came off the bench to give Naperville Central a 2-0 lead 20 minutes into the first half. Defenseman Amanda Albert’s entry pass was deflected by midfielder Paige Silver right to Krebs, who then scored her first goal of the season from five yards out. Naperville Central (4-0) was able to dominate possession all game, and the Redhawks out-shot the Panthers 17-2. Oswego (0-2) had very little success getting the ball past midfield. 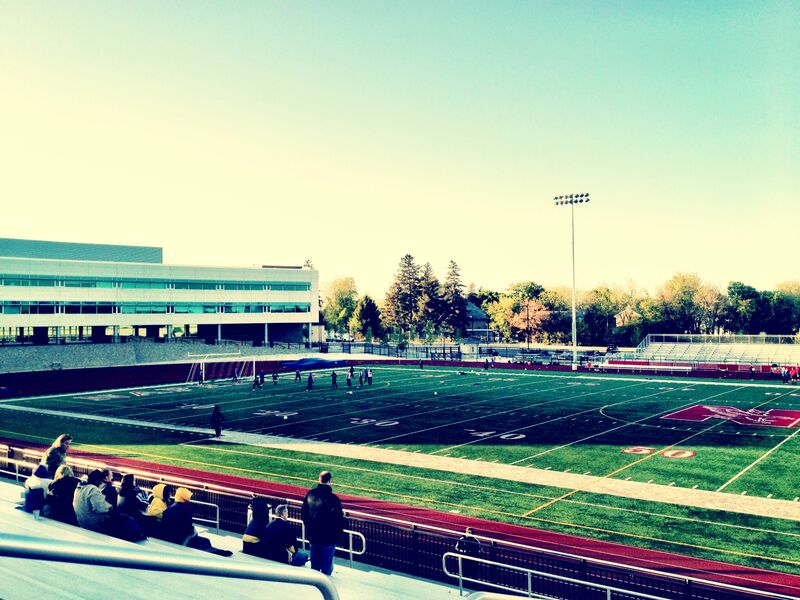 Oswego has yet to score a goal this season. The Redhawks have won their first four games, but Watson said the beginning of the season is about more than just wins and losses. The Redhawks will finish off their opening five-game stretch on Wednesday night against Waubonsie Valley at North Central College. I wrote this story for the Chicago Sun-Times, Naperville Sun and Aurora Beacon. It appears here.